Last weekend’s Pirelli National Superstock 600 Championship with Black Horse race saw a sensational result for Korie McGreevey on the Century Racing Triumph 675R at Silverstone. Having never ridden the Northamptonshire circuit before meant McGreevey was at a disadvantage almost immediately but, that didn’t deter the Ballynahinch 21yr old and after the first free practise session he went third quickest. Hoping to build on the momentum for FP2, disaster struck when on the opening lap of the session, the engine expired and was beyond trackside repair. Not having the budget for a spare engine, all seemed lost until an unlikely opportunity appeared in the distance. A complete bike was on sale in Colchester, 3 hours away by van so Korie, his father and good friend Adam Wilson embarked on the 130-mile journey to collect the replacement. Returning to the circuit at 11pm that night (Friday), work began to transplant the new motor before qualifying on Saturday morning. Having successfully replaced the engine, McGreevey would go on to qualify in a tremendous 4th place, first on the second row. The excitement didn’t finish there though, when on the last lap of qualifying, Korie crashed, damaging the bike and his left hand in the process. Luckily, repairs were made on Saturday night in preparation for the race on Sunday. 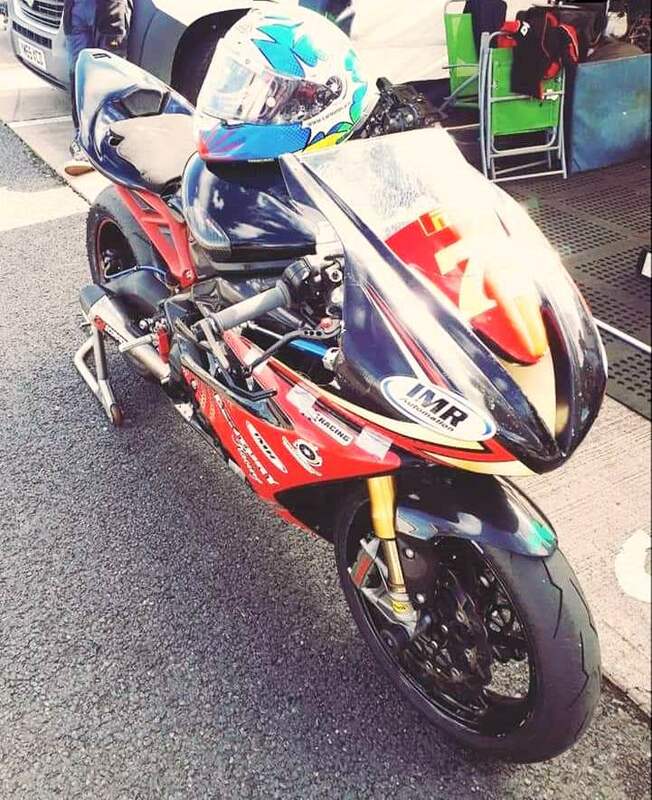 Sunday’s race went better than planned with Korie earning 3rd place in only his third ever Bennett’s British Superbike competition entry, narrowly missing out on P2 by 1/100s from fellow Irishman Aaron Clifford. 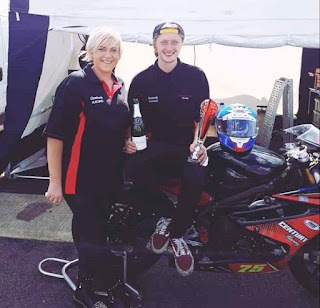 That podium compliments his race victory in the Knockhill BSB round back in July at the Scottish circuit. Unfortunately, the team will not be competing at this weekend’s Oulton park round but, will be back for the Brands Hatch finale in mid-October. We’ll be there too to cheer him on. 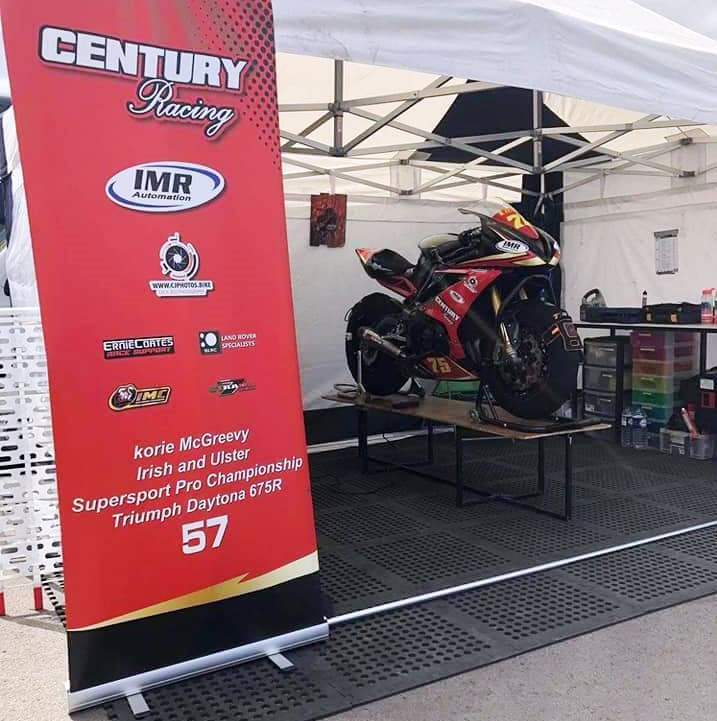 Century racing, IMR racing, CJ photography, Ernie Coates motorcycles, Strada 7, Belfast Land Rover Centre, IMC, Kirsten, Kia, Enlightened Promotions, Adam Wilson, ML design, Alan Carter, Graham family, Alex Knowles, Daryl Heverin, Triumph Aberdeen - Shirlaws Motorcycle and Peter Van Dijk.